Thank-you Victoria for including me in your wonderful series about writers! I love the way you lay out the post and am happy to contribute! What great ideas you share for us all. I will do my best to start writing at least 10 words a day! And I love that writing in sense saved your soul. Good for you. My best wishes for continued success in your career. And I loved seeing this picture of your creative space. Thanks for posting! Wonderful ! And I very much appreciate the way you involved us into your way of working and writing.Nice photo to tag along with which gave the post a beautiful effect of warmth. Christyb, you’re not only a wonderful poet, but a very good blogger. Most people have no idea how to invite others into their world. You have painted a picture with this post…comforting, encouraging to the soul, and gently sharing your life. Great post! Thank-you friends for the supportive comments! 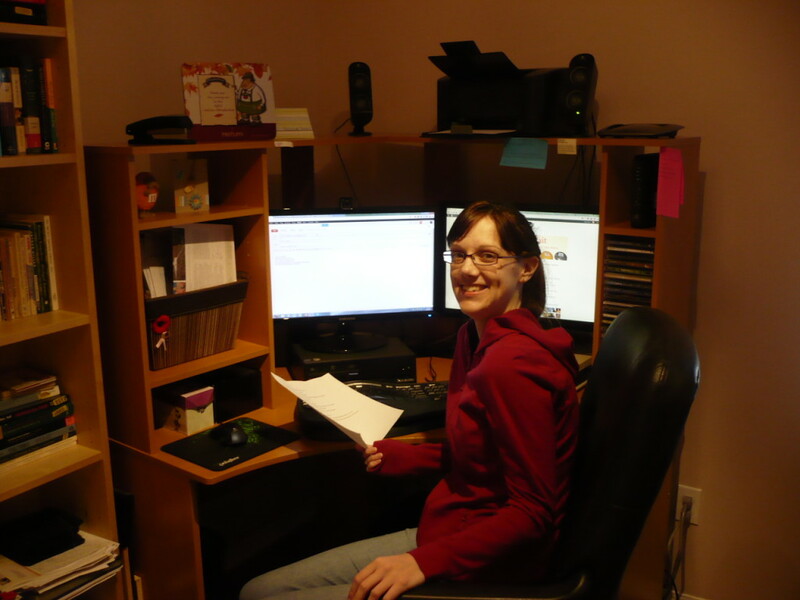 I love that you can all now picture me typing at my desk and learn some of the tips I have learned along the writing journey. I will keep sharing, creating, and smiling! Great to get a peek into your creative space, Christy! Christy, loved the insight into your personal space and creative juices. Your personal photo showed an office of pride and work tools. BUT – what stood out most, was your beaming face, full of pride and joy in what you are doing. That smile and dimples …just like your work…cannot be duplicated! Thanks for sharing your ‘self’. Creativity is an amazing healer! I enjoyed reading about your process and your creative space. I’m wishing you continued motivation and inspiration for all of your writing and to create your dream of a published book of poetry. Happy creating! Thank-you Kelli, Tessa, and Dana for the positive comments. I beam in the photo because I have gone for my dream! With that risk I have been able to start anew and we each have that power within ourselves!